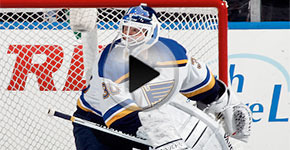 Martin Brodeur's retirement press conference will be streamed live at 10:30 a.m. on Thursday at stlouisblues.com and on the Blues mobile app. 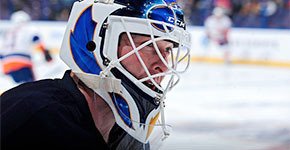 ST. LOUIS – St. Louis Blues President of Hockey Operations and General Manager Doug Armstrong announced today that goaltender Martin Brodeur will announce his retirement from the NHL on Thursday at Scottrade Center. Brodeur will stay with the Blues organization in a management role in hockey operations. The Blues will hold a press conference for the announcement at 10:30 a.m. Thursday and attendees will include Brodeur, Armstrong and Blues Hall-of-Famers Bernie Federko, Brett Hull and Al MacInnis. Neither the Blues or Brodeur will comment on the announcement until Thursday’s press conference. Brodeur, 42, finishes his 22-year NHL career with St. Louis after joining the Blues as a free agent on Dec. 2. He posted a 3-3-0 record with St. Louis, including his final NHL win, a 3-0 shutout against Colorado on Dec. 29 at Scottrade Center. Overall, the Montreal, Quebec, native compiled a 691-397-176 record to go along with a 2.24 goals-against average, a .912 save percentage and 125 shutouts in 1,266 career appearances. He holds regular season NHL goaltending records for wins, shutouts, games played and minutes played (74,438) while in postseason history, he ranks first in starts (204) and shutouts (24) and second in wins (113). Brodeur appeared in 10 NHL All-Star Games and led the NHL in wins nine times, shutouts five times and games played six times, including appearing in 70 or more games in 10 consecutive seasons from 1997-98 to 2007-08. He began his award-winning career with the 1994 Calder Trophy as Rookie of the Year, and went on to earn the Vezina Trophy four times (2003, 2004, 2007, 2008) and the Jennings Trophy five times (1997, 1998, 2003, 2004, 2010). Brodeur was also a three-time Stanley Cup Champion with the New Jersey Devils (1995, 2000, 2003) and a two-time Olympic Gold Medalist with Team Canada (2002, 2010).